Brash, aka CTW Brashy Bimbo, is a 4 year old red fawn female born February 5, 2013. Her sire is Lonesome Cry and her dam is CTW Mystify. 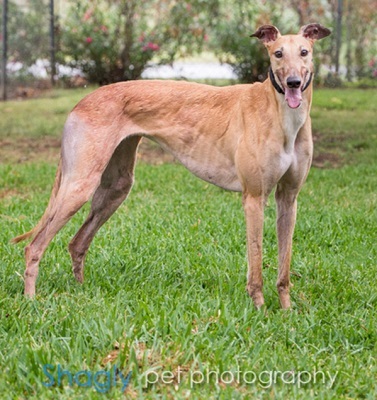 Brash has 158 races to her credit on Greyhound-Data.com, starting at Gulf Greyhound Park in La Marque, TX in 2014. From there she moved to Birmingham, AL, Southland in West Memphis, AR, and finished up her racing career back at Birmingham on May 15, 2017. This girl deserves her very own retirement couch and family. Brash is not cat or small animal tolerant. Brash is a happy girl who loves life. Her favorite things in the world, besides breakfast and dinner, are squeaky toys. She loves them and plays with piles of them. She loves to have her head cradled in the crook of my arm and enjoys a good neck massage while standing with her forehead pushed against my legs. Brash knows how to use a dog door and is crated when her people are not home – she is reluctant to be crated though she will settle in. She enjoys walks and car rides and likes meeting new people. 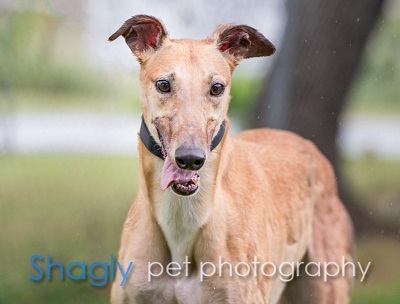 Brash gets along well with other greyhounds and her larger Chihuahua housemate; however, she should not live with cats or small fuzzy dogs. Her ideal home with have another large dog, plenty of toys, a backyard or ability to take long walks to work off some energy and people to cherish.